Prominent Bridgewater Associates executive Bruce Steinberg and his family were among 10 Americans killed when a charter plane crashed into a mountain in Costa Rica on Sunday. The news was first reported by the New York Post yesterday. Bruce and Irene Steinberg and their sons, Matthew, 13, William, 18, and Zachary, 19 were all aboard the single-engine Cessna when it smashed into a mountainous region in the Guancaste province while en route to the capital city of San José, officials said. “The Bridgewater family lost Bruce Steinberg (a senior investor at Bridgewater and a wonderful man) and his family,” Ray Dalio, the founder of the Westport, Connecticut-based hedge fund, said in a Facebook statement on Monday. "Right now, we are each processing this devastating tragedy in our own ways. At this time I will be devoting my attentions to doing this and helping others." "Their children would have changed the world,” family friend Robin Shainberg told The Post. “They were just the most lovely family - the most giving, caring, wonderful friends to have." 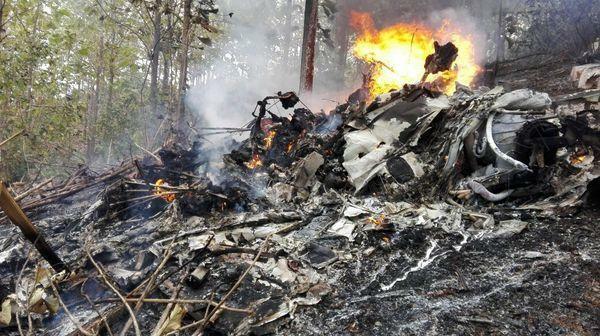 The site of a plane crash in Punta Islita, Costa Rica on Dec. 31. Bruce Steinberg, 50, was a graduate of Columbia Business School, and Irene Steinberg, 51, was active with the UJA-Federation of New York. In 2015, she chaired the annual campaign kickoff of the organization’s Scarsdale Women’s Philanthropy group, according to the New York Post. Bruce Steinberg’s sister mourned the loss of her brother, sister-in-law and “3 amazing nephews” in a Facebook post Sunday night. “We are in utter shock and disbelief right now,” Tamara Steinberg Jacobson wrote, thanking those who were reaching out to her and her devastated parents. The Steinbergs were active in philanthropy and the local Jewish community, Rabbi Jonathan Blake of the Westchester Reform Temple in Scarsdale wrote in a statement on its Facebook page. They were involved with the UJA-Federation of New York, the AJC Jewish advocacy organization and Seeds of Peace. They also were members of the Sunningdale Country Club. “All the Steinbergs will be remembered by their Scarsdale and the temple community as among the most devoted to the welfare of the Jewish community and the beauty of the Jewish tradition,” Blake said. "They will be deeply missed." Authorities in Costa Rica said strong winds were reported in the area of the crash and were being examined as a possible factor in what happened, according to the Associated Press. "No possibility can be left out for certain,” the AP quoted Michael Soto, deputy director of Costa Rica’s Judicial Investigation agency, as saying. “We have two aspects: The principal one would be some weather condition and if there was a mechanical issue." In another crash involving a small aircraft, Compass Group Plc Chief Executive Officer Richard Cousins and four members of his close family were killed when a seaplane crashed into the Hawkesbury River in Sydney, Bloomberg reported.